NRK TV - Ut i naturen: Ikke så grønn likevel? Rull side. No turbines do not pollute! 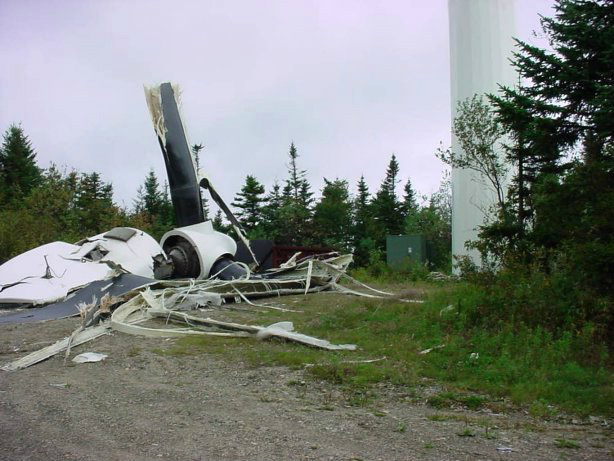 Removing a wind turbine. 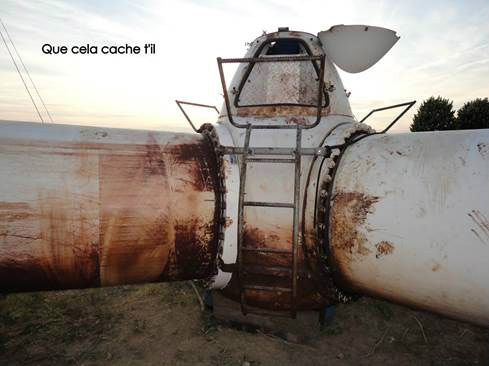 Removing a wind turbine in Belgium at Perwez: Here's one after 10 years, with hundreds of leak liters of oil in the ground. This is the second such accident (non-biodegradable oil leak) in Belgium, after the wind farm Leuze en Hainaut last year. 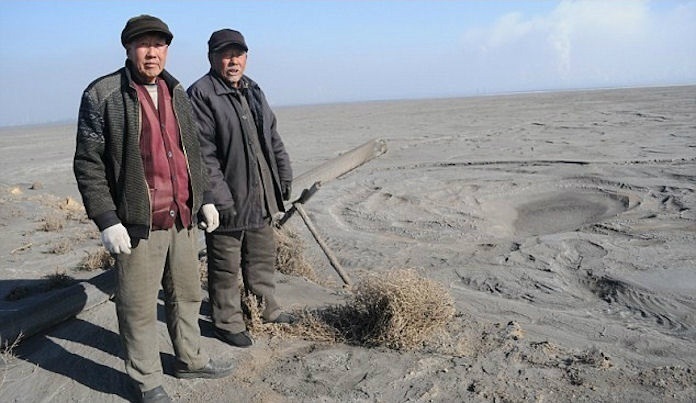 Villagers Su Bairen, 69, and Yan Man Jia Hong, 74, stand on the edge of the six-mile-wide toxic lake in Baotou, China that has devastated their farmland and ruined the health of the people in their community. Channel 4 News International Editor Lindsey Hilsum won the environment story of the year for her piece on rare earth minerals in China. With 95 per cent of the minerals required for low carbon technologies found in China, Lindsey travelled there to report on how the country could soon start restricting exportation of these minerals, and the ruinous process involved in extraction and processing. It doesn't look very green. But, without rare earth, Copenhagen means nothing. You buy a Prius hybrid car and think you're saving the planet. But each motor contains a kilo of neodymium and each battery more than 10 kilos of lanthanum, rare earth elements from China. Green campaigners love wind turbines, but the permanent magnets used to manufacture a 3-megawatt turbine contain some two tons of rare earth. The head of China's Rare Earth Research Institute shows me one of those permanent magnets. He's well aware of the issues. ZHAO ZENGQI, Baotou Rare Earth Research Institute: The environmental problems include air emissions with harmful elements, such as fluorine and sulfur, wastewater that contains excessive acid, and radioactive materials, too. China meets 95 percent of the world's demand for rare earth, and most of the separation and extraction is done here. So, the pollution stays in China, too. LINDSEY HILSUM: The authorities gave us a DVD of Baiyunebo in Inner Mongolia, where most of the world's rare earth is mined, along with iron ore. They wouldn't let us film it ourselves. But at Baotou, 100 miles away, we found the frozen tailing lake where rare earth mixes with mud, waiting for processing at nearby factories. Technologies we all use, like computers, mobile phones and energy-saving light bulbs use rare earths processed here. And local villagers whose farmland has been ruined by seepage from the lake pay the price. WANG CUN GUANG, farmer: The Baotou Environmental Protection Bureau tested our water, and they concluded that it wasn't fit for people or animals to drink or for irrigation. LINDSEY HILSUM: For those who remember the old life, it's hard to understand. The authorities pay compensation, acknowledging that the land has been ruined, but they haven't yet relocated the villagers. JIA BAO CHENG, farmer: Rare earth is the country's resource, but small people like us need to eat, too. We live on farming, but the crops no longer grow, and we will go hungry. LINDSEY HILSUM: At a rare earth conference in Hong Kong, the talk is of how to reduce dependence on China, which achieved 95 percent dominance by undercutting other producers. MARK SMITH, CEO, Molycorp Minerals: If the purpose is to lower our dependence on foreign oil, and all We're doing is asking that we put hybrid cars on the road that need Chinese rare earth materials, aren't we changing, you know, inter-trading one dependence for another? LINDSEY HILSUM: High on the frozen steppe of Inner Mongolia, a huge wind farm. China is aiming to be the world leader in wind energy. Chinese negotiators at Copenhagen may resist political commitments, but the government is already subsidizing new technologies to boost the economy and be sustainable. Deal or no deal at Copenhagen, there's going to be an increased demand for wind turbines, both inside China and outside. But what the Chinese want to ensure is that they're not just providing the essential raw materials, the rare earths, and doing the manufacturing, but that they also have access to the most advanced low-carbon technologies. We were shown plans for what they're calling the Silicon Valley of rare earth, a high-tech industrial park in Baotou to attract international investors. This year, there was an outcry when the Chinese said they would restrict the export of rare earth to conserve their supply, and to make foreign companies produce their high-end technologies here in China. ZHAO ZENGQI: Although China has the largest reserves, we only have 50 percent of global deposits. We are supplying too much rare earth, and it's not sustainable, so we must restrict export. LINDSEY HILSUM: The writing on the wall says: Become the leader of the world in rare earth industry. But China can't produce enough for everyone anymore, and if governments are serious about low-carbon technologies, other countries will have to start producing. MARK SMITH: I think that, if we don't get a couple of projects up and running very, very quickly, there's going to be very severe shortage of rare earths in the world, and all of these clean-energy technologies that we're legislating and trying to implement through policy changes are not going to be possible. LINDSEY HILSUM: Champions of a low-carbon future have yet to wake up to the environmental price Chinese workers and villagers are paying. At Copenhagen, politicians talk of cutting carbon emissions, but they can't meet any targets without rare earth, and that means a sustainable supply, and not all from China.